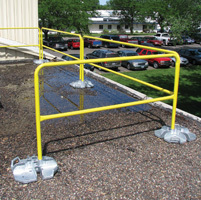 The Portable Guardrail System is a practical fall protection solution. This freestanding system can be erected in minutes and requires no permanent surface attachments. It seals off unprotected areas and is offered in 6-foot, 8-foot and 10-foot sections to fit a site’s specific needs. No special tools are required to install the system.